I got to experience five days of uninterrupted painting at the autumnartworkshop.com a few weeks ago in Aurora, Nebraska, and it was glorious! I am still soaring on such a fun and positive experience. I signed up for the oil painting workshop, the instructor was David Mensing and he was fantastic. He demonstrated different colored background wash colors and block-ins with alizarin crimson. So fantastic and effective. His palette knife technique was amazing to watch and we all benefitted from the individual time we received as he went around the room. One thing I really loved was the concentration on big shapes and values. The first exercise we did was to do a small painting using only one color and white. The next day we were challenged to use two complementary colors and white. These exercises were so good for helping me see and practice the shifts between the values of the landscape. It was the 50th year of this workshop so we celebrated with birthday cake and entertainment. This was only my third time attending, but I hope to attend more often in the coming years. 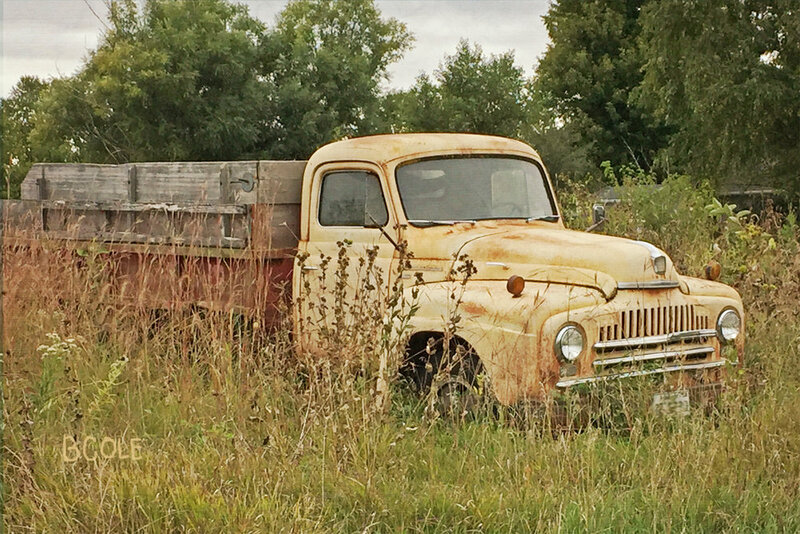 It was held at the Leadership Center in Aurora, there is a wonderful walking trail adjacent to the camp and this cool old truck was parked nearby. Here are some of the pieces I worked on during the five days. May I just say I loved being able to start painting just as the sun was coming up without having to worry about cooking a meal, answering the phone, changing a load of laundry or going to the store. It was a wonderful retreat and I am very grateful that I was able to attend. Maybe I’ll see you there next year? Here's some video footage from 10/11 news to get you thinking about it!